The U.S. Navy has begun to fire electromagnetic railgun hypervelocity projectiles from an Army howitzer through a series of developmental tests in an effort to expedite the deployment of the rounds to battlefields, Scout Warrior reported Monday. Kris Osborn writes the hypervelocity projectile, which costs $25,000 per round, is designed as a kinetic energy warhead and works to travel up to 5,600 miles per hour to target hostile weapons systems, vehicle bunkers, aircraft and enemy missiles at greater distances. 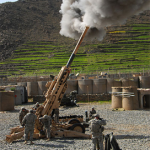 William Roper, director of the Defense Department’s strategic capabilities office, told Scout Warrior that a 155m howitzer has a muzzle breach that works to capture some of the hypervelocity projectile’s propellant in order to make firing operations safer for warfighters. The Navy plans to equip its fleet of surface ships such as destroyers and cruisers with electromagnetic railgun HVPs, Osborn reports. 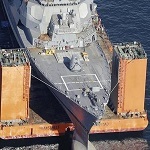 Service branch officials also told the publication that the Navy has started to assess the possible integration of electromagnetic railguns with its DDG 1000 destroyer ships by mid-2020s.